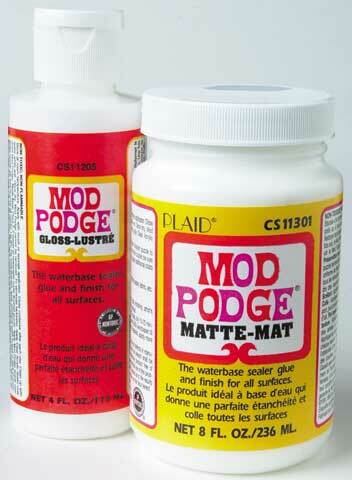 The all-in-one sealer, glue and finish, Mod Podge is perfect for use with paper, wood, fabric and other porous surfaces. As a glue, it dries clear, holds tight, is non-toxic and can be cleaned up with soap and water, making it great for kids. As a sealer, it protects acrylic paints, stains, decoupage and fabrics. As a finish, it may be sanded between coats for an ultra smooth surface.